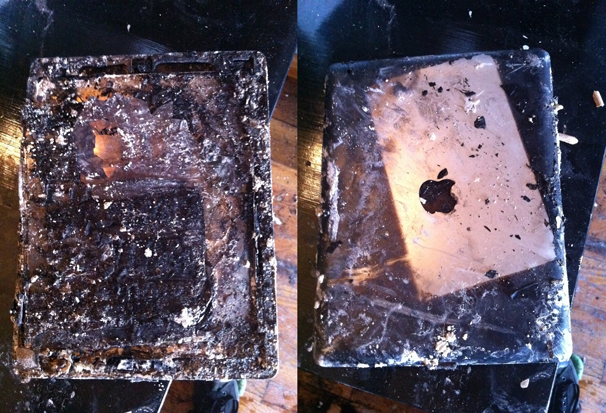 Don't let this happen to your gadgets. Last month, a faulty electrical outlet in my charming turn-of-the-century studio apartment sparked a fire while I was out of the house. Many of my gadgets were singed, and what wasn't directly burnt still suffered damage from smoke and/or water from the automated sprinklers. Truly, it was a geek's worst nightmare! My trusty MacBook Pro, iPad, Xbox 360, and countless other gadgets were bricked, including my primary backup hard drive (thank goodness for data recovery). So, for my first blog back at GeekTech I thought it would be apropos to compose this short list of fire prevention gadgets I only wish I knew about before the incident. This smoke alarm will send an SMS to up to 4 different phone numbers. When it smells smoke you can program it to dial 911, text your mobile phone, post a Tweet, and update your Facebook status all at the same time! Old surge protectors are the culprit in many house fires. Even if they are UL rated, many have been damaged due to age or past surges but provide no indication as to whether or not they are actually still protecting. Your surge protector should have an LED indicator, and while you're upgrading, why not get one that conserves power too- like this one that turns off all connected gadgets when a master device is powered off. After all, why have your speakers siphoning power like vampires when your computer is switched off? I always back up by data fastidiously, and unfortunately my primary backup drive was a casualty of the fire. In retrospect I wish I had one of these- not only is fireproof AND waterproof, it includes a data recovery service in the event of a disaster. There is also an SSD version, which is even less prone to failure and has faster read/write speeds to boot. Redundant backups are important, and having one offsite is a great idea. Depending on your needs, there are many solutions: Dropbox is great for storing small files on a remote server that you can access from anywhere, including your smartphone. Dolly Drive is another great choice that store your entire Time Machine backup cache online. Okay, maybe this is overkill but I really think that a fireproof laptop safe would have come in handy.